Orangeville, ON – Mike Schreiner, leader of the Green Party of Ontario, issued a challenge to Kathleen Wynne, Tim Hudak and Andrea Horwath to put food and water first. 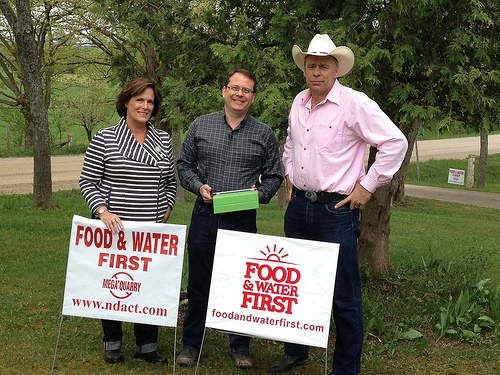 Schreiner joined Food & Water First Chair Carl Cosack and local candidate Paula Conning today to become the first provincial party leader to sign the Food & Water First pledge. The Food & Water First campaign is a citizen led effort inspired by the anti-mega quarry campaign. The goal is to have provincial law changed so that Class 1 farmland — the most fertile land — is protected in Ontario. 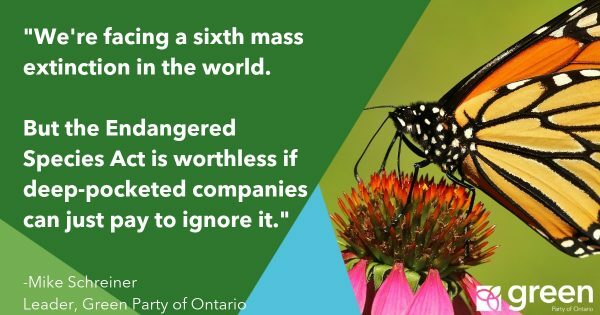 Only 5 per cent of Ontario’s land mass is suitable for growing food and even less — just 0.5% — is prime farmland. The food and farming sector is now the largest employer in Ontario. Over 717,000 people are employed in food and farming. The sector contributes over $67 billion to Ontario’s economy.